Roatan beaches are some of the best in the Caribbean. Water temperatures average 27c (80F). 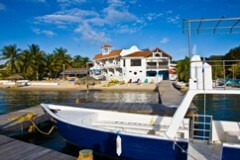 Roatan’s West Bay Beach is perhaps the most famous strip on the island which is likely why Lonely Planet (2010) describes its white sands as “pitch perfect”. West Bay Beach offers a variety of amenities including dive resorts, restaurants and pubs, water sports equipment, souvenir shops and even a strolling ice cream vendor that delivers cool treats right to your lounge chair! Excellent snorkelling is located just off the beach particularly at the western end. Ever dreamed of swimming with dolphins? How about snorkelling with dolphins? Diving with dolphins? On Roatan, you can do any or all of these. Learn about the fascinating creatures from qualified trainers and come face to face with some 20 Atlantic Bottlenose dolphins! If that’s not enough, you can even become a “Trainer For-A-Day” and get plenty of water time with your new best friends. Baan Suerte offers massages, reflexology, aromatherapy and a range of other decadent spa services including facials, manicures, pedicures and soothing baths.